This Special Cd Release tour we will feature choirs from each town we visit!! 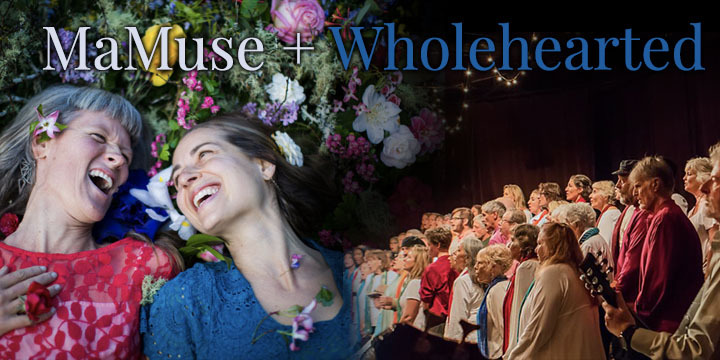 In the Monterrey area we are DELIGHTED and HONORED to feature WHOLEHEARTED CHORUS!! Wholehearted aims to help us embody in more full way both NEW songs from our latest album and oldie goldie MaMuse songs. Oh People! What an evening this will be! We will be singing songs from the current river of new arrivals, oldie but goodie songs from the past many sing along delights and many WITH FULL CHORUS! Come and celebrate this joyous event with us. Tickets available online until 7:30 day of the event, and available AT THE DOOR form 7:30 on.. Note that this venue can be cool even in the summer months, bring layers to suit your temperature needs.